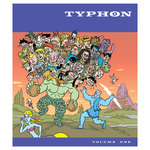 If this isn't the unlikeliest comic book adaptation of all time, we don't know what is. 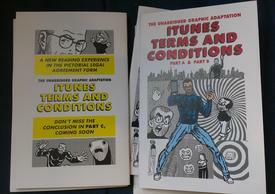 R. "Masterpiece Comics" Sikoryak's iTunes Terms and Conditions, Part A & Part B: The Unabridged Graphic Adaptation is Just In @ Copacetic (And, yes, Part C is forthcoming). Drawn -- semi-miraculously -- in four 24-hour bursts (and subsequently retouched), this 36 page comic adapts this cumbersome text employing 36 judiciously chosen classic comics templates by artist greats ranging from Steranko to Jack Kirby to Osamu Tezuka to Charles Schulz to Dan DeCarlo to Todd McFarlane to Frank Miller to... well, you get the idea. Click to agree to experience the thrill of conjunctive disjuncture.